If you've lived in Phoenix for more than a few years, you realize that the city tears down buildings, and builds new ones, all of the time. It's the story that I know personally of the Phoenix that I first saw in 1977, and from what I've been learning of its history, it's been going on since 1870, when Phoenix first began. The first buildings were adobe, then the railroad arrived, and those buildings went away to be replaced with brick buildings, then in the 1920s the embarrassing old brick buildings were replaced with streamlined buildings, and then after World War II those buildings were knocked down or re-skinned to look more modern, and on and on and on. I often think that anyone who lived in Phoenix, and went away for a few years, would come back to a city that looked very different, from Territorial times up to right now. If you're an old-timer like me, and are still giving directions by saying "Where the New Yorker restaurant used to be", it can be disconcerting. Of course, that place has been gone so long that most of the people never even knew about it, and really, I never went there, so it really couldn't have been all that important to me. If this constant change bothers you, you have two choices, either accept it, or do something about it. A city like Phoenix has had tremendous "growing pains" all of its life. It just plain grows out of things - churches get too small for the congregations, stores get to small for the growing population, that sort of thing. But many times businesses go away simply because people don't spend their money there anymore. So if you're protesting on Facebook, or considering writing a stern letter to someone, and are driving past a local store to spend your money elsewhere, you're wasting your time. Speaking for myself, I've been shopping as local as I could for the 20+years I've been living in this neighborhood. I take my dog to the vet that's a few blocks away, I have my burgers at my local sports bar. The only business that I haven't supported is the tattoo shop (sorry, can't do that). Living in a growing, dynamic, city like Phoenix means growth. People like it there, and more and more people move in. That means bigger buildings, and that's perfectly normal. You can't stop that. But if you like the local businesses in your neighborhood, vote with your wallet. Go there, buy something. You can't always stop your neighborhood into changing into something you don't recognize, but you can do your little part. And you can encourage your neighbors to do the same. 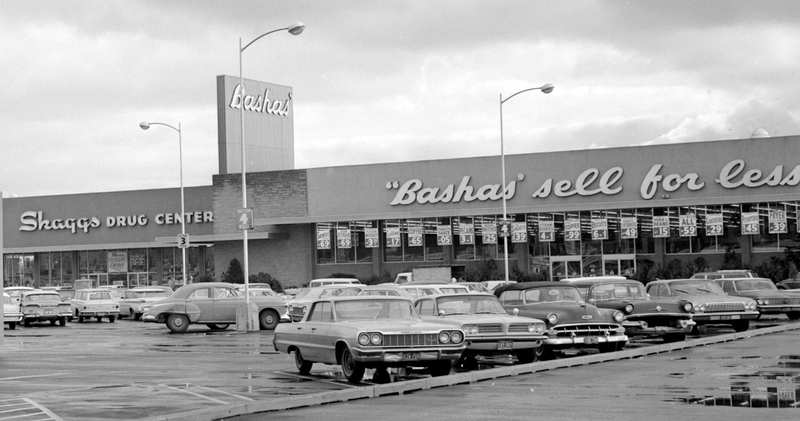 Image at the top of this post: Bashas in Phoenix in the 1960s. I don't have an exact location for this, but it's very similar to the one on 7th Avenue and Osborn, which, as of this writing, is about to be torn down.